Williamson Animal Services, Inc benefitting Williamson County Animal Center with the mission of “Making Williamson County Tennessee better for animals through adoption, education, enforcement and pet population control. Visit their website at: www.adoptwcac.org. One Generation Away – “Wiping Hunger off the Face of America.” One Gen Away distributes healthy food to families throughout Middle Tennessee that currently do not have access to food sources due to economic and physical barriers. Check them out at www.onegenaway.com. Each Night – Please bring non-perishable food items for the OneGenAway food collection bins. One Generation Away was birthed from the dream that we can eliminate poverty, racism, and denominationalism in our lifetime. We believe that there is a mission field right outside our front door, and that we will reach people lovingly through service. OneGen is dedicated to providing emergency food service to those in need via mobile pantries, as well as through partnerships with hospitals, social workers, schools, law enforcement, churches, civic groups, and many others who want to wipe hunger off the face of America. #MyGenIsOneGen marks our commitment to taking ownership of these social issues and working to better our community, together. OneGenAway volunteers come from a number of churches, other civic organizations, companies and individuals who want to help out – including food recipients themselves. OneGenAway provides a number of options to volunteer: We always need volunteers at our Food Distribution events when we typically distribute 20,000 pounds of food to approximately 280-300 families. With a warehouse in Franklin, we also need volunteers now to do some of the organizing and boxing (so that our food distributions can be even more efficient). If you have other skills that you think could benefit us (like fundraising), we would love you to participate. THURSDAY is “Tough Enough to Wear Pink” Night! Together we are fighting breast cancer and raising money to help find a cure. Wear your pink to show support for those fighting the fight and those who have conquered it. 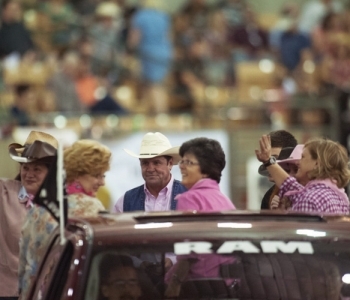 Tough Enough to Wear Pink was created by entrepreneur and breast cancer survivor Terry Wheatley to bring the sport of professional rodeo and the western community together to rally against breast cancer. Since its inception in 2004, TETWP has empowered rodeos and western events in the U.S. and Canada to focus attention on the need for a cure. To date, the campaign has raised $5 million dollars for breast cancer charities, much of which stays right in the community. 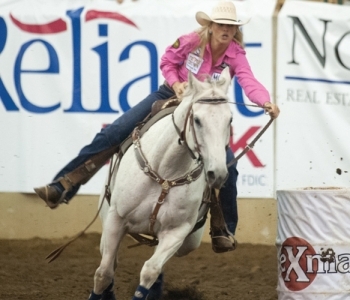 The grassroots movement has inspired other sports communities to mount their own TETWP campaigns, spreading a message of hope and support that reaches beyond the rodeo arena to competitors, families and fans across America.